Hello, i am searching for a 27" monitor for General Use (Web Browsing, Movies, Videos) and a little bit of Gaming but without wanting anything heavy. I am playing LoL or CS just for fun to pass my little free time. I have an old Sapphire Radeon HD7850 which i will not upgrade surely until the end of 2019. I am watching this monitor because it's a VA Panel, where the colors will be good, but it has the Hz and Response Time of a Gaming Monitor. Can someone tell me his opionion? Will 27" in 1080p resolution be bad with pixels on reading staff? I am reading generally an average of good comments about this monitor and on this price i think it's a good deal. Monitor size depends on how far you are from the monitor. If 2-3 feet, get 24" 1080p VA panel. If 4-6 feet, get 27" 1080p VA panel. You'd be seeing individual pixels of 27" 1080p monitor at 2-3 feet, hence why it's better to go with 24" 1080p at that distance. Thanks a lot for your answer. I will consider the distance a lot. If my distance from the monitor is like 3 feet and i buy a monitor which is 27" but QHD with 1440p resolution. Will i have problem with the pixels too? Since there are more pixels on the 1440p monitor (3.686.400) than for 1080p monitor (2.073.600), i don't think you'd be seeing individual pixels of 27" monitor at about 3 feet. Though, you might if you have really good eyesight. I am 3-4 feet from the monitor, i have it on my desk, which is not so big. However I have a 22" monitor for like 10 years now and i think i want a bigger upgrade. I think that if i choose 24" it won't make any big difference, so i preferred 27". That Samsung monitor looks good but with 4ms GTG response time and VA panel, you could go with 4ms IPS panel instead. With IPS panel, you'd get the best colors possible while having the same 4ms response time as with Samsung CJG50 monitor. Great, but these monitors are out of my budget and i don't like them at all. I am searching something between 300-350$ most! Don't get me wrong, it might is stupid, but i want a bezeless monitor. Is it necessary with this monitor to have a new GPU too? Also, while LG monitor is IPS panel, it has response time of 5ms and refresh rate of 60 Hz. That monitor is great if you don't play games. For gaming, 5ms response time and 60 Hz isn't that good. Oh, there are no bezeless monitors out there. What there are, are monitors with very thin physical bezel (like my MSI monitor with 2mm physical bezel) but you will have black border at the edges of the screen due to that (measured mine and it comes to 8mm total, including 2mm physical bezel). "Bezeless" is wrong terminology, "very thin bezel" is more accurate. Though, some smart phones do have true bezeless screen where the screen itself bends around the edge (e.g Samsung Galaxy S9). Now, unfortunately I am neither US or UK, I am from Greece, and here the monitor shopping it's a little bit difficult. The monitor you propose is a little bit new on the market I guess, so here in Greece I can find it only in one e-shop and on the price of 500$. I know that my GPU is old, but again my main purpose isn't Gaming. I play games, but occasionally and I have not really big expectations. So will 5ms and 60Hz be such a problem? Sure I prefer a monitor with more Hz and lower response time, but I dont know if I need it so much. I don't need 4K though I know, 1440p will do it's job too, but I have so many options and I can't get a decision. The monitor resolution (1080p, 1440p, 4K) depends on the GPU you're running. If you're planning to go with GTX 1060/1660/Ti, 1080p monitor would be best. For GTX 1070/Ti/RTX 2060, 1440p monitor is best suited and i listed the GPUs for 4K monitor above. It seems that you've already decided the monitor size: 27", so, that is done. As far as which panel (TN, VA, IPS) to go for, make clear what you want from the monitor. If high refresh rates with shortest response time where color accuracy isn't that important, TN panel is best. But if you want to get the best looking images where monitor performance isn't that important, IPS panel is best. Or if you can't decide between the two, go with VA panel which is best from both worlds. Response time matters only if you're competitive gamer and need to have all your input registered and shown back to you as soon as possible without motion blur. Also, in fast-paced games (FPS, racing), shortest response time (1ms) is best. For casual gaming and/or slow-paced games, 4ms response time would be enough. Higher refresh rate gives you smoother image. 60Hz is standard while 144Hz is butter smooth and more enjoyable. Out of all the monitors listed here (excluding my MSI monitor), i'd go with Samsung CJG50. While it does have 4ms response time, it also has 144Hz refresh rate, VA panel and curved screen as well. Curvature on 27" monitor gives quite a bit of immersion. My MSI monitor is also curved (1500R) but since it's 24" in size, the immersion isn't that noticeable but it's there. Out of all the monitors listed here (excluding my MSI monitor), i'd go with Samsung CJG50. While it does have 4ms response time, it also has 144Hz refresh rate, VA panel and curved screen as well. Yeah, I was actually thinking of pointing out that one as well, even before seeing them bring it up, as it offers a higher resolution while maintaining nearly all of the other major features of the screen they were initially looking at, without raising the price too much. However, it is worth point out that the screen lacks variable refresh rate (FreeSync), which is something I would want to have in a 144Hz screen. I believe their current graphics card doesn't support adaptive sync in games, but it would be a good feature to have for whenever they eventually update their graphics card. Also, depending on what games they play, 1440p might be a bit much for their 7850. LOL and CS might run decently enough at that resolution, but it would still cut into frame rates. The higher resolution would likely be good to have for desktop use though. And while IPS might generally have the most accurate colors, VA offers much higher contrast, while still typically offering better colors than TN panel screens. For their needs mentioned in the first post, I think VA would be a good choice. Freesync is only useful if OP either stays with his Radeon GPU or goes with better Radeon GPU (e.g RX 590). Nvidia GPU (GT/GTX/RTX) doesn't care about Freesync, instead G-Sync is for Nvidia GPUs. But since Nvidia has royalties on G-Sync, G-Sync monitors can cost near the double of same spec monitor that doesn't have G-Sync. Still, all is not lost when going with Nvidia GPU and Freesync/ non-Freesync monitor. 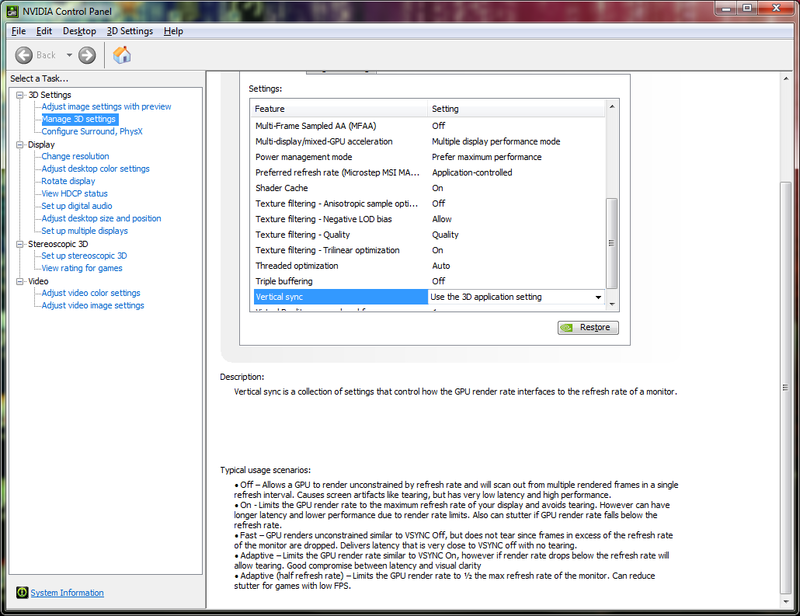 From Nvidia Control panel settings, one can enable Nvidia Adaptive VSync to reduce screen tearing and stutter. I've done so with my Nvidia GPU and MSI monitor. So, i made several runs in Unigine Heaven benchmark with different settings and i tell right away that i couldn't see any screen tearing. It could be that my eye isn't trained to see screen tearing since i don't play fast-paced games almost at all. Or it's because Unigine Heaven, which is slow-paced benchmark. Faster-paced benchmark (e.g in GTA V) might show the screen tearing better but i don't have that game. For Unigine Heaven, i used lowest settings @ 1080p fullscreen to get FPS high enough for testing. Off - no FPS cap and FPS averaged 220 with peak about 360. A lot of stuttering. Fast - FPS averaged around 200 with peak about 240. Some stuttering. On - FPS capped to 144 max. Slight stuttering. Adaptive - FPS capped to 144 max. Very little stuttering. Adaptive (half rate) - FPS capped to 72 max. No stuttering. So, to answer your question: Yes, newer Nvidia drivers do allow the usage of Adaptive Vsync with my 144 Hz MSI monitor and GTX 1060. Thank you for all your answers and help. I have already exclude TN Panel. I think is mostly for Gaming use and i don't need it. I am between IPS and VA Panel and I think too, that VA Panel is for a more general use (little gaming and a lot of movies) than IPS, however i am not already sure if i would go with IPS or VA, because IPS could work for these jobs too. As for the resolution, sure i would first go with QHD (1440p). I think though that for my use and for my eyes 1080p will do the job. However again QHD is much more better than the classic Full HD especially for 27". I would have already buy Samsung CJG50, but i am reading for variety of problems like ghosting, bad 1080p to 1440p uspcale and of course lack of FreeSync. So i am not really sure and i am asking you. Let's for example compare the Samsung CJG50 with the Acer Nitro VG270. Is it worth it for an unprofessional use like mine, to spend double the price of Acer, to go with a monitor like the Samsung? Will i have a benefit let's say in the future if i "invest" double the money in a better monitor like Samsung? I say again, the only problem in my mind is that i don't have a really big economic comfort to spend those money and i am not sure if i really need all these features like 144Hz (not competitve gaming) or QHD etc. I know i might get you tired with all these questions, but i have to decide. I might go again and see examples of monitors myself at shops here in Greece. But we have very poor variety of monitors at our shops and of course we are missing latest releases. For example i won't find Acer Nitro VG270 anywhere here in Greece for at least months from now. If the Acer Nitro VG270 costs $500 in one of the e-shops you found it, how much the Samsung CJG50 costs at local store? Double the price of Acer would put the Samsung at $1000. At that price, Samsung CJG50 isn't worth it. * Acer can do 1ms response time with VRB enabled. Given that both monitors have the same price, Acer Nitro VG270 would do better for web browsing and casual gaming. Samsung CJG50 is good when you're a gamer, where 144Hz refresh rate and curved screen benefit the gaming experience. So, for your use, i'd say that Acer Nitro VG270 is better, given it fits your budget. In the future, when you have better monetary situation and you can afford better PC hardware, you can always buy a new monitor. Either run the dual-monitor setup or sell the old one. If you have such a low selection of monitors in local shops, how about buying from Amazon? Last i checked, Amazon does international shipping and i've ordered several PC components from Amazon. Mostly from Amazon.de since it's closer to me but i've also ordered from Amazon.com. Though, shipping from USA and across the pond (Atlantic Ocean) costs quite a bit. The only Acer Nitro I found here in Greece is the Acer Nitro VG270U Pbmiipx with 1440p resolution has 144Hz and it costs 500+$. The other models of Acer Nitro are VG270 and RG270 but with Full HD (1080p) and they cost around 200$. The CJG50 costs from 320$ to 370$. So I think that we are not talking about the same Acer Nitro model. But anyway, I am curious. If they are at the same cost, why would I get Acer? Isn't CJG50 that good for web browsing and twice as good as the Acer at gaming? If they have the same price and Samsung offers double the specs (excepts 4ms which is good for the gaming I want), why would I buy the Acer Nitro? I didn't search Amazon, because usually has the same price if we count shipping and staff and moreover i have never used Amazon before for shipping here in Greece. I have been using ebay, Gearbest or Bangood, but small staff and things I can't find here in Greece. Usually for things like Monitors, GPU and generally PC Hardware if we compare Greek Shops with Amazon we have up or down the same cost. But I think I could give it a try for a monitor that hasn't been released here yet. Here in Greece we have the problem that anything new we want to buy, we have to search it in Greek e-shops which they get their staff from outside the country. Greek physical shops where I can go to have a look at the monitors too, have older monitors and generally older staff. I will look at Amazon, if I find something that we don't have here. About the Acer Nitro and the Samsung CJG50 I think that we are talking about different edition of the Acer, because here we have 1080p Acer Nitro at 200$. So at this price isn't worth it to give 100 - 150$ more to go with the Samsung to get 1440p and 144Hz? The Acer Nitro monitor i was comparing and also linking above from amazon.uk has the model of "VG270Ubmiipx" or "VG270U bmiipx". I was talking about the 2nd monitor in the list since compared to the Samsung, Acer monitor has IPS panel, 1ms response time, FreeSync, built-in speakers and 75Hz refresh rate. Emphasis here is on IPS panel (best colors) and 1ms response time (ideal for gaming). Also, 75Hz is better than 60Hz and some people do like the built-in speakers. FreeSync it has can also come useful. What it doesn't have is curved screen and 144Hz refresh rate but like you said, Samsung monitor is more like a gamer's monitor and you may not need that high-end monitor for your use, hence why i said Acer would suit you better. Oh, if you don't have VG270U bmiipx available at your location then no worries. There are other monitors as well which to choose from. Only difference i can tell between the two is that C27JG52 is 27" while CJG50 is 26.9". At 200 quid, that 27", 1440p, IPS panel and 60Hz monitor comes with very good price but at your local Greece store, it will be with full price, hence beating the point of me suggesting it to you. That's also one of the reasons why i suggest you buy your monitor from amazon. You are right. Amazon is a very good solution and has many many different monitors at a very good price. To be honest i was searching a store or e-shop in Greece to buy a monitor with installments. I don't know if you have this in your country. With installments i pay with my credit card and i don't pay full price right away, but i pay a specific amount of money every month, for 12 or 24 or even 36 months in some cases until I pay the full price of the item i bought. It's easy because I don't have to pay full price immediately, but I pay an amount of money every month i got paid from my job, so it's easier to handle things. But, in this case, with Amazon's range of monitors and prices, i have to think about it seriously to pay and buy a good monitor right away. I have to admit that the Acer RC271Usmipuzx and the Samsung LC27JG52QQUXEN you posted are very good monitors with a great price. Especially for my country these monitors aren't anywhere on the market and if there were, they would cost, let's say at least 300$ to 400$. 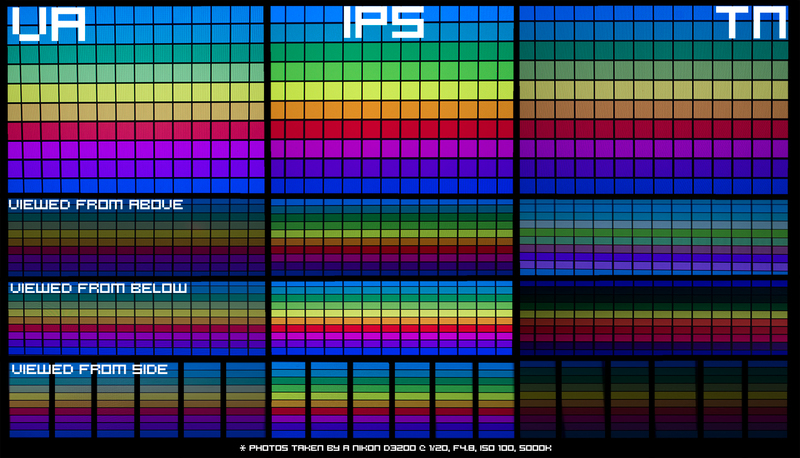 I see that you insist on IPS, because of the better colors and this is something i have to admit i need more than Hz because, the gaming time is less than my movies time. Also, i don't mind helping you or others in TH forums, even when they come with additional questions and topic turns into more of a discussion rather than the straight question -> answer topic. Oh, in my local electronics stores, i can also buy hardware with monthly installments. Though, i, personally, don't like to do that since there's a chance of missing the payment and in the end, you'll pay more for that piece of hardware rather than buying it out at once. As far as amazon goes, i do like their huge selection of products and sales they do. It's hard for local store to compete with amazon and offer the same good deals as amazon does since local store couldn't afford to sell same monitor with cheaper price, else-ways, local store would loose money on the sale. Amazon is so big that they make up the discounted price difference from other products they sell. And for end user, discounted product even with the shipping price included can be cheaper than in local store. Though, depending from where you buy, you'll have shipping time to wait out. For me, i can get products from amazon.de in 2-3 days while from amazon.com, shipping time is about 2 weeks (i live in Estonia). Wow, you live in a small and "strange" country as well. Don't misunderstand the "strange" word. I mean as for shopping and especially shipping situation. I am sure that in your stores, they haven't got so big range of products too. I will search in Amazon because of the big range as you say. I can find any monitor old or new in a good price. I wasn't thinking of Amazon because of shipping and lack of installments, but in the case that i can get a great monitor (for my use) at a very good price, of course I will consider it as well. I am now seeing the two monitors you proposed. Acer and Samsung. I see that Acer is beautiful monitor with good specs (for my use again) and at a very good price. On the other hand, Samsung CJG52 is better on specs and a little bit more expensive, but in the comments i read many posts for dead pixels, monitors that were replaced and then they had dead pixels again. Even so the Acer monitor doesn't have any comments to adopt an opinion, I think that it isn't so must for me to "risk" it with the Samsung monitor which is more expensive too. Because Acer monitor will get the job done for me too, i guess. From UK Amazon, or DE Amazon, how many Euros do you pay for shipping? (Let's talk with Euros now that i know you live in Estonia). Every time i was thinking about Amazon and buy staff from there, i was thinking a big amount of money, just for Shipping, so in the end, i thought that even a product with discount will cost more or less the same price as it would cost here in my country, so i wasn't searching in Amazon to buy staff. If Amazon makes discounts and sales often, maybe i could wait a little more days to find something good. If i'd look at my local electronics retailers then yes, monitor selection in them is small but i don't shop there. Instead, i buy directly from my country's importer who have partnership with dozens of warehouses all over the world. They carry a plethora of all kind of different electronics; e.g household appliances, cash registers, office appliances, TV/audio, power tools, laptops, desktop PC hardware, servers, networking hardware, professional cameras, movie equipment etc etc. Only those few select items they don't carry i look up from Amazon. Also, all 3x of my PCs: Skylake, Haswell and AMD (full specs with pics in my sig) are built thanks to that single importer in my country. With Amazon, the shipping price depends on how fast you want your product to arrive. Expedited shipping from Amazon.de gets my product here in 2-3 days but also costs more. Standard shipping is 7-14 days from Amazon.de. Shipping price also depends on heavy the item is and if you include the gift wrap packaging as well. So, it's hard for me to say how much the shipping for monitor costs for you. You'll see the final shipping price just before you're about to pay for the item. Heaviest item i bought from Amazon.de (4.84kg) is my AverMedia Ballista Trinity speakers (link). Since i choosed gift wrapping and Expedited Delivery, shipping costed me €32. Unfortunately, I think here in Greece i can't do that with the importer and it's sad because it would be helpful. I see that the Acer RC271U has a price around 300$+ and now on Amazon i can buy it half price which is good and I think i'll give it a try with Amazon. I want to ask you something though. If you were on my situation, which monitor would you choose? Samsung LC27JG52 or Acer RC271U? The price difference it's insignificant, so which monitor would you choose between both and why? Freesync is only useful if OP either stays with his Radeon GPU or goes with better Radeon GPU (e.g RX 590). Nvidia GPU (GT/GTX/RTX) doesn't care about Freesync, instead G-Sync is for Nvidia GPUs. Actually, Nvidia finally enabled support for variable refresh rate on FreeSync displays for their 10-series and newer cards a couple months back. As long as a FreeSync display supports the feature over a DisplayPort connection, it should work equally well on either an AMD or Nvidia graphics card. Nvidia certifies some of these FreeSync displays that meet all their criteria for G-Sync as being "G-Sync Compatible", and with those the feature will be enabled automatically, but it can be manually enabled in the settings for all FreeSync displays that support the feature over DisplayPort. That's the good thing about having an open standard rather than a proprietary solution like traditional G-Sync. Essentially, there isn't much point in paying extra for a G-Sync display now over an equivalent FreeSync one. Both AMD and Nvidia now support AMD's solution for variable refresh rate, and Intel likely will as well once their dedicated graphics cards start coming out next year. It's a though call between the two. Both monitors have the same 4ms response time but Acer RC271U monitor refresh rate is far lower than Samsung LC27JG52 monitor has it (60Hz vs 144Hz). Only thing Acer has better than Samsung is the IPS panel Acer monitor has. Based on my own personal experience with TN and VA panels, including 60Hz and 144Hz monitors; VA panel monitor has a lot (and i mean A LOT) better color accuracy than TN panel monitor offers. I'm still amazed at times how good colors look on my MSI Optix MAG241CR VA panel monitor. Note: before the MSI monitor, i used TN panel monitors and before that, old CRT monitors. When it comes to the refresh rate, i can hardly tell a difference between 60Hz and 144Hz. Though, i don't play fast-paced games (i'm casual gamer, just like you) and that might be the reason why i can't tell a difference between 60Hz and 144Hz. If you look at the Acer monitor specs, there is no word about the monitor's contrast ratio. Is it 500:1? 750:1? 1000:1? Not a single word since IPS panels don't have good contrast ratio. On the Samsung monitor specs, the 3000:1 contrast ratio is proudly presented. My MSI monitor also has contrast ratio of 3000:1. Between the Acer and Samsung, i, personally, would go with Samsung. Not only because Samsung is 144Hz with curved screen (those are bonuses) but also because i do a lot of photo editing and i need to have a good contrast ratio. To me, better contrast ratio offered by VA panel is more important than wider color gamma offered by IPS panel. Your analysis is something else!! Thank you very much, firstly for your time and then for your help. I think i'd go with a VA Panel too. Unfortunately, the CJG52 which was on sale on Amazon. it isn't anymore. So i'd go with SAMSUNG LC27JG50 which here in my country has 369€ and i can get it with installments, which is a little bit comfortable for me, so I don't have to pay full price immediately, but a small amount every month. I don't know if you have an opinion on LC27JG50, if you have a negative or positive thoughts, please let me know! EDIT: Then i saw MSI Optix MAG271C, which is as i see a great monitor too at the same price. But it's 1920x1080, so i think this is a big negative compared to LC27JG50. As far as i can tell, there are small differences in features between C27JG50 (aka CJG50) and C27JG52 (aka CJG52). CJG52 is aimed at gamers and includes the "Game UI" OSD interface. This includes some settings like: "Low Input Lag" mode, some gaming presets, "black equalizer" and "refresh rate optimizor" (which allows you to select the refresh rate via the monitor). Other than those few settings, both monitors are and perform identically. Though, since MSI monitors are one of the best (if not the best) VA panel monitors out there, they also come with premium price. I payed premium for my MSI monitor as well: €308.90 and it's the 24", 1080p, 144Hz monitor. For 27", 1440p, 144Hz MSI monitor (those three above), you might be looking at €500+.